FieldTech’s certified professionals have the experience to provide you with upgrades, modifications, conversions, or a complete overhaul of your existing system. Solving specific avionic needs and building reliable systems. Fieldtech Asia, Inc. brings a fresh and innovative approach to the aviation industry, providing Sales and Service of Aviation products and modification services at an economical cost to the end user and represents all of the major OEMs in the industry through dealership contracts and/or service agreements. 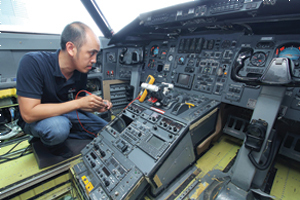 Fieldtech Asia, Inc. provides superior Sales and Service of Aircraft Avionics, Accessories, and Support Equipment, as well as Aircraft Modification and Avionics Upgrade Services, serving both the domestic and international markets of the Military, Commercial and Private Aviation sectors. Our goal is to exceed the expectations of every client by offering outstanding customer service, increased flexibility, and greater value, thus optimizing support system functionality and operation efficiency. In order to meet the individual needs of clients, Fieldtech Asia, Inc. maintains a wide range of qualifications. We excel in providing aviation spares and aviation component repair and overhaul services throughout the various aviation sectors utilizing our extensive knowledge base, highly qualified technicians and mechanics as well as extensive experience in the industry. Solving specific avionic needs and building reliable systems.